It is not too late to submit your abstract! This program is also available as a pdf document. The official program, with extra essays and information is also available in the pdf format (20 MB). "The Last Score of Years"
Also, a list of contributors to the Centennial Fund and their tributes to their mentors appeared on the inside covers of the program. Abstracts for some of the papers listed below are available on this site. Click on the paper's title to see the abstract. 3:00 p.m. Coffee will be available when open. Roman Literary and Historical Constructions of Mothers in the First Centuries BCE and CE. author of the M. Didius Falco Roman mystery books. 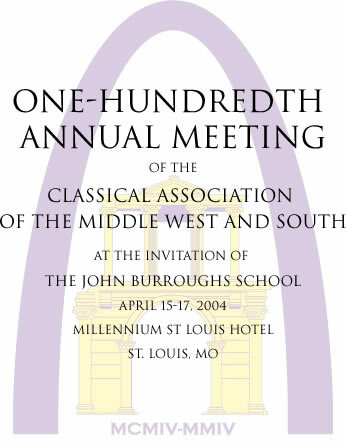 Section A: Panel: Classical Influences in American Detective Fiction (Jefferson Suites A). Plenary Session: Celebration of the CAMWS Centennial. Presidential Address: Novus ordo saeculorum: The future as our challenge; The past as our guide. Wine and Cocktails will be available from a cash bar at 7 p.m.
Presidents: Roger Hornsby 1969, Arthur Stocker 1971, Herbert W. Benario 1972, Alexander McKay 1973, Kenneth Reckford 1976, Charles Babcock 1978, Harry Rutledge 1980, G. Karl Galinsky 1981, Mark Morford 1982, Susan Wiltshire 1984, Eleanor Huzar 1985, Gareth Schmeling 1986, Theodore Tarkow 1987, Ernst Fredericksmeyer 1988, Ward Briggs 1989, David Bright 1990, Michael Gagarin 1990, Kenneth Kitchell 1991, Joy King 1992, Karelisa Hartigan 1993, Kathryn Thomas 1994-1995, William Race 1996, Helena Dettmer 1997, John F. Hall 1998, James M. May 1999, John F. Miller 2000, Christopher P. Craig 2001, James S. Ruebel 2002, Niall Slater 2003, Jenny Strauss Clay 2004. Secretary-Treasurers: W. W. de Grummond 1973-1975, Gareth Schmeling 1975-1981, John F. Hall (Brigham Young)1990-1996, Gregory N. Daugherty (Randolph-Macon) 1996-2004, Anne H. Groton (St. Olaf ) 2004-. 4. Heri, Hodie, Cras: Perspectives on Change in the Classroom.